« Vote For M.i in the TDE Feature Contest! With the exception of a few tracks, the bulk of production is handled by the in-house production team of J57 and The Audible Doctor; these two guys blow my mind with every new revelation of their sound, and the instrumental melodies on Awaken are a no different. “So I’ve been walking on a thin rope a hundred feet plus/they say never look down, but it’s probably even worse looking up/blinded by the sun, but dad never shared the same/guess it could be a good thing/his death is what sacred me straight”. One of the standout tracks on the album is “Watch the Sky Fall”, and the thing that makes this song so impressive (besides Marco Polo’s beat) is Koncept’s ability to spit bar-for-bar with one of the greatest emcees in the game – Royce Da 5’9″; this track alone makes the album worth purchasing. 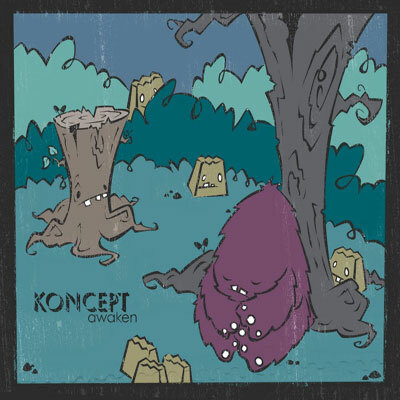 Koncept’s witty wordplay and poignant punchlines prove the point that he’s not to be taken lightly. J57 does an incredible job of lacing “Aspirations” with an extraordinarily laid back beat filled with smooth strings and vivacious vocal samples; furthermore, Soul Kahn’s catchy hook adds yet another great element to an already incredible track. There’s really only one gripe that I can even bring up when talking about Awaken: it’s just over thirty-two minutes long; however, Shakespeare once said “brevity is the soul of wit”, and in Koncept’s case, this statement holds a great deal of weight. On the inside, Awaken is a dark descent into one man’s mind, but on the outside, it’s an illuminated vision into the future of the East Coast Hip-Hop scene. This entry was posted on Wednesday, July 25, 2012 at 9:16 pm and is filed under Album Review, Music Reviews with tags Awaken, Brown Bag All-Stars, J57, Koncept, Royce Da 5'9", Soul Kahn, The Audible Doctor. You can follow any responses to this entry through the RSS 2.0 feed. You can leave a response, or trackback from your own site.